Risk assessment can be life or death for a bank. Do it right, it’s a win-win for the bank and the customer. Getting it wrong is like hitting an iceberg you didn’t see coming. Hit enough of them and the ship sinks. The key, then, is finding the sweet spot when it comes to risk v. reward by identifying the risk in the first place and knowing what to look out for. Fewer icebergs. More smooth sailing. The customer doesn’t provide adequate information. Current financials are a must and strict adherence to the list of what’s needed is important. In fact, if the customer cannot get you what you need in a timely manner, then most likely they are a ship without a GPS. It can be because it’s an inconvenience and it takes time out of their day to find what’s needed, but that doesn’t mean the bank should slide on obtaining the information. Dig in. Get it, or leave it. Assumptions are a bad thing and any laziness on the part of the customer or the bank can provide trouble down the road. Trouble spelled S.I.N.K. Not enough collateral coverage. Generally, you need more than you think you need. When a loan goes bad and you must sell the collateral and most of the time at discount prices, it’s rarely enough, so you’re not covered. Get more if possible. The borrower doesn’t understand their business cycles. Perhaps neither does the analyst. This is a cousin to #1, but this one plays out over time, because they may not be accounting for the seasonal or market changes. When a post-mortem occurs on a loan, and you go back to the initial underwriting, that loan shouldn’t have been made because policy disciplines were not held in place. It could be based on information for that industry, too. Consider oil and gas loans. You must understand that the industry is volatile over time. It can be risky in the short-term or long-term because it’s a volatile industry. Stress-testing the customer and industry is important. Real estate can have large swings, and it does go up and down but over a long period of time it has historically normalized. A lot of banks don’t have an accurate assessment of cash flow until the deal goes bad. Even those who know their cash flow doesn’t mean they won’t fail. Remember, everything a bank does is leveraged, using someone else’s money. 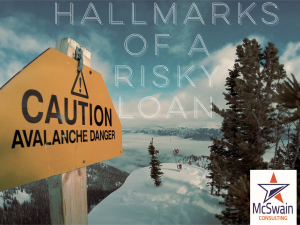 So how do we avoid the three big hallmarks of a risky loan? Tick off these musts and you’re more likely to avoid rough waters ahead. Know what you are doing. Have the right loan policy for that loan, which means having a variety of loan options based on the industry and proper speed bumps. Be aware of that industry. If you don’t know it, research it and even get to know it in person. People loaning the money should understand cash flows to stay abreast of how the borrower is doing. Stop in. Read up. Stay engaged. Have adequate cash flow and collateral. Some bankers don’t understand that even if they get principal back, they still lost money on loan. How? Look at the principal and interest in its entirety. If you don’t collect it, you have opportunity cost. Most bankers don’t count that as a loss, but it’s an impairment that can come back to bump you like that iceberg. Know the cost of carry for a bad loan. Add in legal expenses, lack of collecting interest, liquidation expenses. It adds up in a hurry.